Ali Wong delivers a Baby Cobra; Grace & Frankie and Chelsea are back. 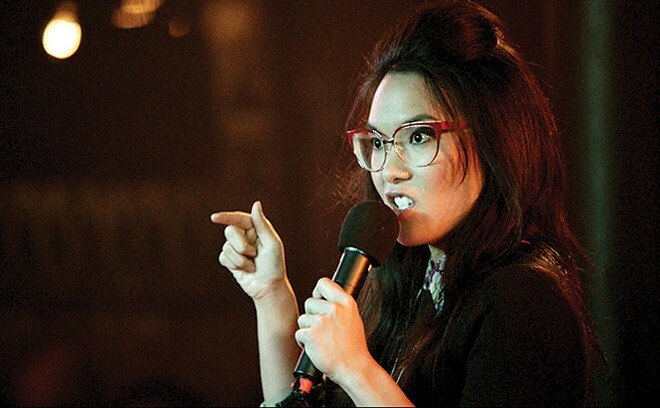 Stand-Up Special: Ali Wong is one of the funniest comedians you've probably never heard of—and she's definitely the most pregnant one you've ever seen in her own stand-up special (Wong was seven months along when Baby Cobra was filmed in Seattle). You may have noticed her in a few passable movies (Savages, Dealin' With Idiots), and some truly painful TV shows (Are You There, Chelsea? and the legendarily stoopid Black Box), but she's been seemingly on the verge of becoming a breakout comic for years. I'm not saying the knocked-up/debut Netflix special hook was timed and calculated for maximum media buzz but, really, what else are babies good for? If that just tweaked your tweakables, you'll squirm over Wong's take on feminism; maybe stay away from Baby Cobra. Season Premiere: The debut season of Grace & Frankie, while uneven, at least established a better benchmark for oldster comedy than the theatrical crap cannon of insufferable hacks like Nancy Meyers (Something Complicated's Gotta Give on the Holiday or whatever). The story of lifetime frenemies Grace (Jane Fonda) and Frankie (Lily Tomlin), whose husbands (Martin Sheen and Sam Waterston) leave them for each other, careened from hilarious to heartbreaking and back again wildly, but never felt anything less than genuine, and the supporting cast (including Ethan Embry and June Diane Raphael) added nicely to G&F's already considerable charms. Tighter scripting might elevate the series' second go-around to the critical-darling level of Transparent but, at the very least, Grace & Frankie is The Odd Couple reboot we actually deserved. Oh, and Sheen and Waterston are uh-dor-a-ble. New Series: W. Kamau Bell's late-night talk show, Totally Biased, was a good introduction to the comedian's unique angle on race relations—until FX essentially killed it by relocating the show to FXX. But Bell is really onto something with United Shades of America, a kind of reverse-Bourdain travelogue series wherein he visits the least-desirable destinations in 'Merica and attempts to start dialogues with its least-desirable subcultures. United Shades' debut episode, in which Bell went impressively face-to-hood with the Ku Klux Klan, was a ratings and social-media-buzz hit, and the San Quentin-set second installment didn't disappoint, either. Sadly, he probably won't run out of racist enclaves anytime soon, but watch the funny/frightening United Shades of America now, hard. Series Debut: If you compiled a list of things we don't need on TV, somewhere near the top would be "Freddie Prinze Jr." and "amateur celebrity impressionists" (No. 1 will always be "Jay Leno"). So leave it to USA, who were making such quality dramatic inroads with Mr. Robot and Colony, to give us First Impressions, a Prinze Jr.-hosted impersonation competition with "mentor" Dana Carvey, and "coaches" like Steve Carrell, Kevin Nealon, Jon Lovitz and ... oh, goddamnit ... Jay Leno. Who was the soon-to-be-unemployed USA programming wiz who said, "You know what Millennials like? Endless Christopher Walken impressions and comedians from the '90s! It'll blow up on SnapFace and InstaVine!"? Series Debut: Chelsea Handler shut down her E! talk show, Chelsea Lately, almost two years ago, and now she's finally back with ... something. Not much is known about Chelsea, Netflix's first attempt at a semi-daily, topical series; as of this writing, the debut episode hasn't even been recorded yet. The few leaked facts: Chelsea will stream Wednesdays, Thursdays and Fridays, with material taped 12 hours prior; there will be 90 episodes a year, lighter than the typical late-night talker grind; Handler won't always be stuck in a studio, as she plans on shooting across the U.S. and internationally; she won't be tied to the old E! topics of celebrity culture, instead taking on politics, education, sports, alternative lifestyles and, most likely, celebrity culture more scathingly than she could ever get away with on basic cable. Whatever Chelsea will be, it's going to be on Handler's terms only—that kind of power in the hands of someone so funny, smart and selectively vicious warrants a look.